This page is no longer being maintained; please visit the new page at http://www.edithwhartonsociety.org/faq. This page will take you there in 5 seconds. This page addresses some of the questions that visitors to the site have asked. Who was Edith Wharton, and why is she an important figure in American literature? Whom should I contact for copyright permissions, such as reprinting a work, using extended quotations, or publishing a previously unpublished letter? Did Edith Wharton once say, "If only we could stop trying to be happy, we could have a really good time?" Can you summarize the plot of this Edith Wharton novel or story for me and tell me its most important themes and characters? Are any of Edith Wharton's houses still standing, and, if so, where can I find them? How can I order back issues of The Edith Wharton Review? Are back issues available online? Were any movies made of Edith Wharton's works, and, if so, where can I see them? Where can I get a copy of the 1934 movie version of The Age of Innocence (or another movie not currently available)? How do I cite a page from your site in my Works Cited page? What is "the word" at the end of The House of Mirth? I'm writing a paper on an Edith Wharton novel (or short story). Where can I find online criticism and journal articles about it? I have an old copy of a novel by Edith Wharton. Can you tell me what it's worth? I'm new to Wharton studies and would like to get a general sense of her life and works. Where should I start? Which of her works were Edith Wharton's favorites? I recall reading a quotation in which Edith Wharton compared a woman's life to a house full of rooms. Where can I find that in her works? I published an article two months ago, and you don't have it on the site. Why isn't the site up to date with adding articles? Did Wharton once write,"There are two ways of spreading light: to be the candle or the mirror that reflects it"? If so, where does it appear in her writings? What is the best biography of Edith Wharton? Are there any sound recordings or movies made of Edith Wharton reading her works? Who was Edith Wharton, and why is she an important figure in American literature? Abby Werlock's biographical sketch at this site provides some good answers to this question. Did Edith Wharton once say, "If only we'd stop trying to be happy, we could have a pretty good time?" Not quite, but she did express this sentiment in "The Last Asset" (1904): The old gentleman made a contemptuous motion. "Possibilities of what? Of being multifariously miserable? There are lots of ways of being miserable, but there's only one way of being comfortable, and that is to stop running round after happiness. If you make up your mind not to be happy there's no reason why you shouldn't have a fairly good time." See "The Ending of The House of Mirth: What was the Word?" for some possible answers. The best criticism on Wharton is published in books and peer-reviewed journals. Many peer-reviewed journals are available online, however, through services such as ProQuest or Project Muse. If you're a college or university student, or if you live near a college or university, the university library will be your best source for criticism on Wharton. Most libraries will have several of the journals and books listed in the Wharton bibliographies. If not, they can be ordered through Interlibrary Loan. Many libraries will have access to FirstSearch, which includes the MLA Bibliography, and they will also have one or more of the following full-text databases. You can go to your local university library's home page and see which of these resources are available to you. However, these resources are generally available by subscription; they are free only on-campus or to registered students and faculty. The Edith Wharton Review has back issues online for free. Google Books has quite a sampling of scholarly books on Wharton. You can find articles and books on your topic by searching the bibliographies at the Wharton Society site or by using the MLA Bibliography. You will also find some short bibliographies on individual stories in the Queries and Student Queries pages, and you can search this site for other references. For example, one of the pages has a bibliography on "Roman Fever" and "The Other Two." Try Google Booksfor a start, which will give you snippets of some scholarly books. Amazon.com sells some individual articles, as does Project Muse, but they are expensive. Sorry--we can't do that. The Wharton Society site is staffed by volunteers who all work at other jobs (mostly at universities), doesn't keep articles on Wharton in a central repository, and can't send materials to individuals. You can find quite a bit of information on the site, especially in the Summaries section; if you can't find the information, submit a Query or Student Query. You can also your local college or university library for articles on the topic, or see the question above for online possibilities. If you can't get an article through Interlibrary Loan, try an online search for the journal title and contact the publisher directly. Queries that resemble the third part of this question are not posted and receive no response, for obvious reasons. The Recommended Works list should help. We hope to have a specific list of books to help introduce readers to Wharton. You might also want to look at Sarah Bird Wright's Edith Wharton: A to Z. This is an encyclopedia-style book about Wharton with short essays on topics related to Wharton and her works. Each essay has a brief bibliography, too. Looking at the essays here would help you to see what you'd be most interested in pursuing. You will find some brief summaries and discussion questions that will help you to determine the themes on the Summaries and Discussion Questions for Wharton's Major Texts section of this site. If there's a summary on the site, you can find it under Summaries; if there isn't--sorry, but we aren't able to respond to individual requests to summarize stories, provide questions, send articles or summarize critics' responses to works, etc., although your request will be posted so that other readers can respond. To find the value of old books, contact your local bookseller or check the prices for comparable rare and used books on ebay.com, amazon.com, abebooks.com, www.bookfinder.com, or other such sites. You can also contact the Antiquarian Booksellers Association of America for information about finding the value of a book. Which biography of Edith Wharton is the best? You can find some assessments of the various biographies on the Queries 1999 page. I sent a query to the site yesterday. Did you get it? Why isn't it posted yet? Posting queries and replies is done by hand (i.e., there's no automated process whereby these appear on the site), so they may have to wait until I have time to post them. Most are collected and posted once a week, although at busy times such as the end of the semester the wait may be a bit longer. I don't send an acknowledgment when queries or replies are received, but you can check back to see if your question or response on the site is posted to the site. Some kinds of queries already addressed in the FAQ ("Send me all your information about Edith Wharton immediately") will not be posted. I would like to quote from an unpublished letter by Edith Wharton. Where can I get permission to do so? telephone 1 212 352 0080, fax 1 212 889 0596. I recall reading a quotation in which Edith Wharton compared a woman's life to a house full of rooms. Where can I find that in her works? "You have hit upon the exact word; I was fond of him, yes, just as I was fond of my grandmother, and the house that I was born in, and my old nurse. Oh, I was fond of him, and we were counted a very happy couple. But I have sometimes thought that a woman's nature is like a great house full of rooms: there is the hall, through which everyone passes in going in and out; the drawing- room, where one receives formal visits; the sitting-room, where the members of the family come and go as they list; but beyond that, far beyond, are other rooms, the handles of whose doors perhaps are never turned; no one knows the way to them, no one knows whither they lead; and in the innermost room, the holy of holies, the soul sits alone and waits for a footstep that never comes." 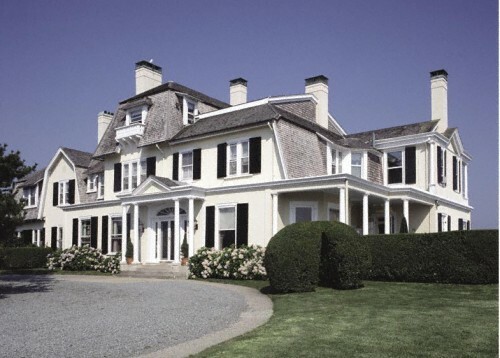 Are any of Edith Wharton's homes still standing, and where can I find them? Several of the homes and places associated with Edith Wharton are still standing; some are privately owned, but others can be toured. Here is a brief list. You can also read about The Mount at The Mount: Edith Wharton and the American Renaissance. Boston. Although Wharton did not live in Boston, Edward (Teddy) Wharton was born there, and the couple stayed with his mother at her house at 127 Beacon Street (Lewis 71) on several occasions. When their marriage began to dissolve, Teddy Wharton rented an apartment in Boston. "The Jones family house on 23rd Street was altered repeatedly and is now unrecognizable outside. The house at 28 West 25th Street was demolished, but anyone who seeks to recapture a touch of Edith Wharton's New York should still visit the south side of the street, west of Broadway, where she lived with her mother until her marriage in 1885. From there the young Edith Jones looked across the street to what is now the Serbian Orthodox Church of St. Sava, at 15 West 25th Street. In 1885 it was Trinity Chapel, and it was there she married. A visitor can usually peek into St. Sava on Sundays, when services are held at 10:30 a.m., and the interior has hardly changed since the Jones-Wharton wedding. Outside, the front steps sag with the weight of generations, but on her wedding day, Edith Jones would probably not have gone in through this door - only out." (See more excerpts in "Edith Wharton in the News" for 9/12/2004. Trinity Chapel, West 25th Street (Edith and Teddy Wharton were married there on 29 April 1885.). 884-882 Park Avenue. In 1891 EW bought 884 Park Ave and a few years later bought 882. These are near the corner of 78th Street. (If anyone has information about this address as it exists today, please e-mail me.) From the New York Times (9/12/2004): "Like nearly all of the other known homes of Edith Wharton in New York, 884 Park has been demolished, but the stable she used while on Park still survives, at 111 East 77th Street. It has some delicate little stone carving around the windows, but she bought the stable already completed, so it is doubtful her hand is evident in the design." The New York Times lists a tour given by the 92nd Street Y: (On Sundays). At 1 p.m. "Edith Wharton's New York," with a tour of sites in Madison Square and Gramercy Park. Fees: $25 to $40. Meeting places and reservations: (212) 415-5500. Up the Hudson River from New York is Rhinebeck; The Age of Innocence and The House of Mirth have a lot of descriptions of houses in that area, including the Vanderbilt mansion near Hyde Park.Two late novels, Hudson River Bracketed and The Gods Arrive, also deal extensively with Hudson River architecture. Wyndcliffe. Edith Wharton's aunt, Elizabeth Schermerhorn Jones, built a 24-room house called Wyndcliffe in Rhinebeck in 1852. Legend has it that this is the source of the phrase "keeping up with the Joneses." Pictures and descriptions are available on the Web at http://www.hudsonvalleyruins.org/yasinsac/wyndcliffe/wyndcliffe.html . A collection of drawings, pictures, and maps is available at the American Memory Home Page. Note: A stable URL is not available for this page; click on the link and type "wyndcliffe" in the search box. Many of the Gilded Age houses of Newport are open for tours, including The Breakers. Pictures of several of these are available on the Newport Mansions site at http://www.newportmansions.org. Paris. In Paris, Edith Wharton lived at 58, rue de Varenne and later 53, rue de Varenne before purchasing homes at Pavillon Colombe in Paris (in St.-Brice-sous-Foret). Pavillon Colombe is privately owned and not open to the public. Riviera. In 1919, Wharton purchased a chateau in Hyeres on the Riviera (Ste. Claire du Vieux Chateau). Good sources of information, besides the biographies by Shari Benstock, R.W. B. Lewis, Hermione Lee, and Eleanor Dwight, include Theresa Craig's Edith Wharton: A House Full of Rooms and Sarah Bird Wright's Edith Wharton from A to Z. Yes, Edith Wharton wrote this. It appears in "Vesalius in Zante," one of the poems from her collection Artemis to Actaeon (1909). I published an article two months ago, and you don't have it on the site. Why isn't the site up to date with adding articles and books? If you want your book or article to appear, send the information to the site. The new publications pages are updated periodically based on the MLA Bibliography. There is no paid staff to hunt down members' publications and update the site based on searches. Have any Edith Wharton works been made into movies? Are they readily available? Can you help me get a copy of one that I can't find on VHS or DVD? You can find a list of these (and availability) on the Edith Wharton Filmography page. If it's not listed as available there, it isn't available. Unfortunately, some adaptations, such as those seen on PBS in the early 1980s, can only be seen on television or by visiting an archive such as the Museum of Television and Radio (New York and Los Angeles). We do not have copies or access to copies of unavailable movies, and thus we can't send them to individuals. You can try writing to PBS or requesting the movie through Amazon.com, which reports the level of interest in future DVD releases of these titles to the relevant companies. We get many questions about the 1934 version of The Age of Innocence starring Irene Dunne and John Boles. It is now available at the Warner Archive Collection or through amazon.com or bn.com. Are there any film clips or sound recordings of Edith Wharton? As far as we know, there aren't any sound recordings of Edith Wharton or any film made of her during her lifetime. Please contact the site if you know of any. Why don't you have a copy of "Roman Fever" or some of Wharton's later works posted at your site? "Roman Fever" is still under copyright because it was first published in 1934. Only works published in or prior to 1923 are generally considered to be in the public domain according to U.S. copyright law, so Wharton's works published after 1923 aren't available here. Copies are available on the web, but they might not be legally posted unless permission has been obtained from the Watkins-Loomis Agency or the server exists in a country with different copyright laws. Which of Wharton's works were her personal favorites? According to R. W. B. Lewis, Wharton's favorites included Hudson River Bracketed ("I am sure it is my best book"), The Gods Arrive, The Custom of the Country, Summer, and The Children (490). Thanks to Hildegard Hoeller for this information. This depends on the style your instructor prefers (MLA, Chicago, Turabian), but Diana Hacker's site and a site from the Duke University libraries provide some good examples. Hacker's site also includes examples of in-text citation. The MLA site also has good examples at http://www.mla.org/publications/style/style_faq/style_faq4. Please note that although your Works Cited page should use hanging indents (i.e., indent the second line five spaces more than the first line), this can't be done easily on a web page. Also, the web address URL may be on a separate line since the space here is limited, but it should not be (or does not have to be) on a separate line in your document. Adjust your formatting accordingly. Author Lastname, Author Firstname. "Reply to Question." Online posting. Date of reply. The Edith Wharton Society. Date you accessed the page. <http://www.wsu.edu/~campbelld/wharton/squeries02.htm [or whatever the web address is]>. Hugel, V . "Reply to 'French Draft of Ethan Frome.'" Online posting. 29 Dec. 2004. The Edith Wharton Society. 20 Nov. 2005. <http://www.edithwhartonsociety.org/queries04.htm>. Kinman, Alice. "Re: House of Mirth Ending." Online posting. 24 Mar. 2000. The Edith Wharton Society. 20 Nov. 2005. <http://www.edithwhartonsociety.org/hmending.html>. This is adapted from the personal site example on the MLA site, although it can't fit the model exactly. Author lastname, author firstname. "Page title." Date of the page [this is found at the bottom of every page; MLA form requires only the date of the most recent update]. The Edith Wharton Society. Date you accessed the page. <http://www.wsu.edu/~campbelld/wharton/pagename.htm>. Werlock, Abby. "Biographical Information about Edith Wharton." 22 May 2005. The Edith Wharton Society. 20 November 2005. <http://www.edithwhartonsociety.org/bio.htm>. Campbell, Donna. "Edith Wharton at 18." Edith Wharton: A Life in Pictures and Text. 31 May 2005. The Edith Wharton Society. 20 November 2005. <http://www.wsu.edu/~campbelld/wharton/photo1.htm>. Rich, Charlotte. "Ethan Frome." Summaries and Discussion Questions for Wharton's Major Texts. The Edith Wharton Society. 20 November 2005. < http://www.wsu.edu/~campbelld/wharton/disc/id7.htm>. Campbell, Donna. "Edith Wharton at 18." Edith Wharton: A Life in Pictures and Text. The Edith Wharton Society. Ed. Donna Campbell. 31 May 2005. Washington State University. 20 November 2005. <http://www.wsu.edu/~campbelld/wharton/photo1.htm>. Rich, Charlotte. "Ethan Frome." Summaries and Discussion Questions for Wharton's Major Texts. The Edith Wharton Society. Ed. Donna Campbell. Washington State University. 20 November 2005. <http://www.wsu.edu/~campbelld/wharton/disc/id7.htm>. Please send comments and suggestions to D. Campbell.